So you’re an Informal Learner. You listen to books on tape and instructional recordings, go to lectures, play brain games, read magazines and books, watch documentaries, use certain software, crack open reference works when you need to, and observe the world and its inhabitants. But how do you seal the deal? That is, how do you keep what you’ve learned in your noggin, or at least within reach? If you’re like Informal Learners since time immemorial you record what you learn from life in a Learner’s Journal or notebook. I’m not talking about a diary necessarily. A diary is typically more internally directed, although Michelangelo’s journals were famously both about what he thought and felt in addition to what he was learning. Instead I’m talking about a journal that serves as a kind of repository for what you’ve discovered in your learning as well as a sounding board for your ideas. This post is about two celebrated Informal Learners who rigorously kept Learner’s Journals; the Renaissance men Leonardo da Vinci and Buckminster Fuller. Leonardo was called da Vinci because as the illegitimate son of a Florentine Notary he wasn’t allowed to take his father’s name. da Vinci is the name of the town in northern Tuscany where he was born in 1452. He was an inquisitive child and showed great promise as an artist. At age 14 he was apprenticed to Verrocchio, a Florentine master and polymath who gave Leonardo a broad and first-rate training in all the arts and endowed the younger man with many good habits and a few bad ones. At age 20 or so Leonardo painted one of the children Verrocchio’s The Baptism of Christ, now in the Uffizi Gallery. Leonardo’s work was so stunning that according to legend after seeing the completed form Verrocchio swore he would never paint again. Apparently he never did. da Vinci then went on to spend his rest of his life and career in service to a series of wealthy patrons. But if you thought you were hiring an artist what you got with Leonardo was something more like a free-ranging thinker. Oh, he’d do paintings… although less than 20 survive… and sculptures and such. But he’d also produce plays for the court. In fact he apparently built the first spotlight for just such endeavors. It was a time of war and Leonardo designed siege engines, portable bridges that were built, along with war machines that weren’t like scythe-equipped war wagons, a tank, a parachute, a bike, and a helicopter. How do we know all this about a man who died almost 500 years ago? We have a number, but not all, of da Vinci’s Journals or notebooks. 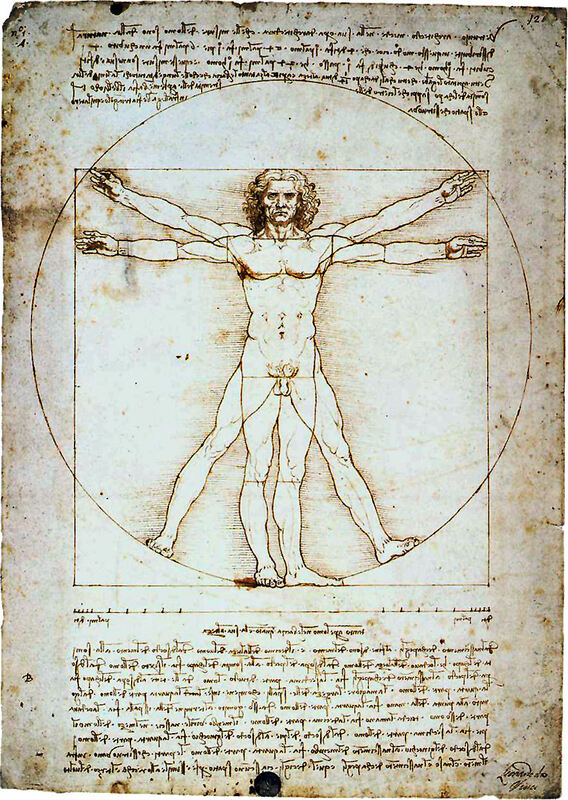 For instance, the famous Vitruvian Man wasn’t a commissioned work; it’s something he undertook as a personal challenge and drew in one of his notebooks. Same with all the stuff listed above. He was an acute observer of birds and bats and fascinated with the idea of human flight. His drawings on flight seemed to go through two phases; where he tried to imitate birds, and upon realizing that humans didn’t have the necessary strength to weight ratio when he turned to more glider-like apparatuses that may have actually been built. All that’s in da Vinci’s journals, too. da Vinci’s nine surviving journals called codices (the plural of codex) are spread all over the world. Bill Gates owns one. The biggest chunk of them are in Britain. The surprise perhaps is that the da Vinci’s Journals are in all different sizes; they’re not regular. Vitruvian Man, which was separated from a journal and is now housed in Venice, is about 13.5 by 9.6 inches. Others were closer to 8×6. He certainly could have constructed the journals himself. But considering their irregularity, da Vinci may have just wandered into local binderies and bought them off the shelf when he needed a new one! R. Buckminster Fuller was born in 1895 in Massachusetts and left it nearly 89 years later with 28 patents, the best known of which was the Geodesic Dome. Fuller, like Bill Gates, was a Harvard dropout. What’s to be learned from these two great learners? If you’re serious as a learner you need to capture what you’ve learned or rather what you’re learning. What do you put in it? Fuller put everything in his, including household bills and the like! da Vinci used both drawings and words, all in his tight and fluid mirror-script, written such that you need a mirror to read it. Do you really need to write it down in this electronic age? Well only if you want to preserve it in an accessible way. A week or so ago I was talking to a book binder who is well-enough versed in the Internet Age to own an Internet company. But he’s also has enough gray hair to remember when the Library of Congress told libraries to preserve their collections on microfiche, much of which is now just goo in a can. Then the preferred storage was old reel-to-reel tape drives, then audio cassette tapes, and 5 inch floppy drives, and Zip drives, and on and on. If you had an early TRS-80 from Radio Shack, and stored all your journal entries on its cassette drive you’d be hard pressed to access any of it now just 25 years later. A good acid-free and lignin-free paper journal with the right ink, will be around until well after your great-great-grandchildren are born. Mr. Spock Can’t Forget the Theme to Gilligan’s Island Either « Thelearnersguild’s Weblog on Want a Super Memory? Keep a Journal and Refer to it Often.